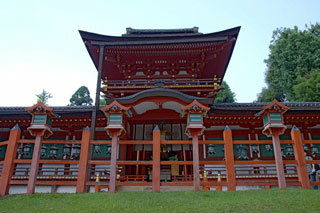 Kasuga Grand Shrine is a Shinto shrine in the city of Nara, in Nara Prefecture, Japan. Established in 768 AD and rebuilt several times over the centuries, it is the shrine of the Fujiwara family. The interior is famous for its many bronze lanterns, as well as the many stone lanterns that lead up the shrine. This article uses material from the Wikipedia article "Kasuga-taisha", which is released under the Creative Commons Attribution-Share-Alike 3.0 License.